Education and Sharing Day recognizes the remarkable efforts of Rabbi Menachem Mendel Schneerson, the Lubavitcher Rebbe, to use values-based education to drive our Nation's children toward the American Dream. As an educator, Rabbi Schneerson understood that education is incomplete if it is devoid of moral development. Working through a spirit of optimism, he strived to teach children to be honest, civil, respectful of differences, and self-disciplined, in addition to being intellectually rigorous. On April 18, 1978, our Nation's first Education Day, U.S.A., Rabbi Schneerson wrote that "we can neither be satisfied nor slacken our efforts" so long as "there is still one child that does not receive an adequate education." These words inspire us today, as they did then, to empower our children and share with each of them the opportunity and promise of America. It is up to us to support our children in realizing their hopes and to encourage them to reach their fullest potential. NOW, THEREFORE, I, DONALD J. TRUMP, President of the United States of America, by virtue of the authority vested in me by the Constitution and the laws of the United States, do hereby proclaim April 7, 2017, as "Education and Sharing Day, U.S.A." I call upon government officials, educators, volunteers, and all the people of the United States to observe this day with appropriate programs, ceremonies, and activities. source: The White House, President Donald J. Trump Proclaims April 7, 2017, as Education and Sharing Day, U.S.A. Guess who had a private audience with Francis? Trump acted as Isis' Air Force when he bombed Assad last week. He's a lying shabbos goy piece of garbage!!! 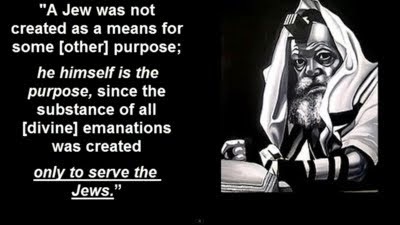 Not anti-semitic, but to comment that all non jew comes from some form of satan...ya not anti "goi" either..keep your talmud and poking babies in eyes.